Congratulations to Dawn Kullmann Bachand! 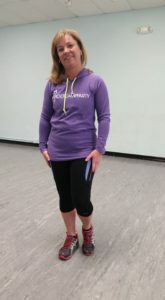 February’s Boot Camp Party Member of the Month! I’ve never seen someone come to class and accomplish so much in so little time! “I was introduced to Dion through a friend, Bobbi Elliott. I was complaining to her that I felt I was in a slump and needed a change. She immediately suggested doing a workout with Dion. She was absolutely right! It was exactly what I needed to change what I was currently doing and see and feel results. During that time I was doing a beachbody video workout on my own, but after joining the Bootcamp workouts with Dion I realized I was not pushing myself at all to my limit, nor giving myself the confidence I needed to push myself more. The 14 pushups that I was doing then, have dramatically increased to 3 sets of 20, and they continue to increase, in just 6 months. I have enjoyed not only the challenge, but also making friends with extraordinary women and men that I look forward to joining each Saturday morning and weekdays. I feel stronger, I have more energy, and definitely have benefitted from the challenge and structure of the workouts. The fact that the combination of cardio, strength, and floor exercises are set to a variety of music I love is definitely a big plus too! Dion is a master at creating a different workout for us each week that leaves us all walking away feeling challenged, at the same time creating a fun environment that leaves us wanting to come back for more! You’re very welcome Dawn! I am honored that you have chosen the boot camp party to achieve your fitness goals! PS. Dawn did 50 push-ups without stopping. The video phone camera was interrupted by a text.